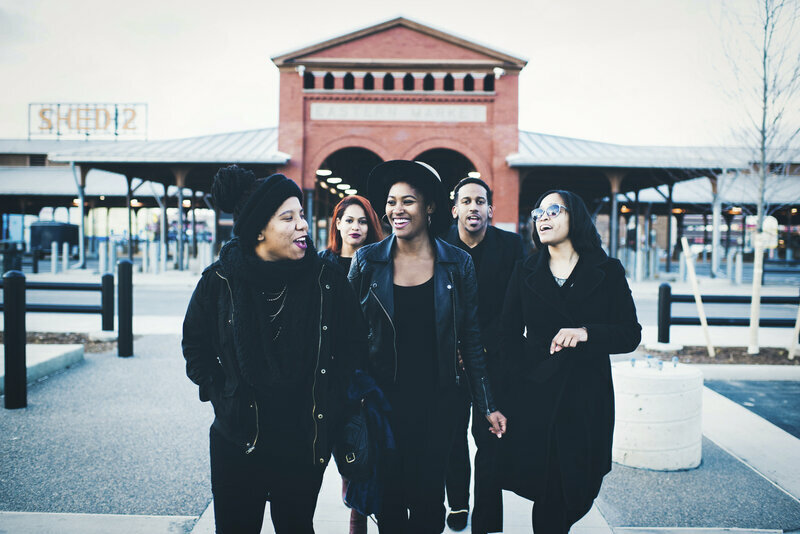 Paige Watkins (from left), Sarah Johnson, Camille Johnson, Chris Turner and Devon Porter stand in front of Detroit's Eastern Market. They are all contributors to Black Bottom LLC, a project committed to recapturing the vibrancy of the Black Bottom community. Unless you grew up in a black family with deep Detroit roots, I'm betting you've never heard of Black Bottom. It was a self-sustaining, all-black neighborhood that flourished on Detroit's eastern edge at the turn of the last century. It's largely forgotten today, replaced by a four-lane highway, but back then its mile-and-a-half main drag bustled with black-owned grocery stores selling produce from local black farmers. The soda fountain at black-owned Barthwell Drugs was always hopping with customers sipping on orange pineapple floats while their orders got filled. Billie Holiday, Langston Hughes, Sammy Davis Jr. and Jackie Robinson were guests at the Gotham Hotel, a hot spot for black film stars, blues artists and athletes who were often barred from the city's white hotels. Fed by the Great Migration of Southern black folks moving north and west in search of a better life, the neighborhood was a vibrant black oasis despite cramped conditions, the poverty of its residents, and predatory landlords. In fact, over time, Black Bottom — originally named for its dark soil, back when the area was farmland — became an epicenter for black wealth in the region. According to one timeline of Black Bottom's history, in 1920 it contained most of Detroit's then 350 black-owned businesses, including "17 physicians, 22 lawyers, 22 barbershops, 13 dentists, 12 cartage agencies, 11 tailors, 10 restaurants, 10 real estate dealers, 8 grocers, 6 drugstores, 5 undertakers, 4 employment agencies, and 1 candy maker." Black Bottom has been compared to Bourbon Street in New Orleans, and a resident from the glory days who still lives nearby swears it was "better than Harlem." But in 1954, the neighborhood was torn down in the name of urban renewal and beautification, replaced by I-375, the freeway I take to get to my parents' house on the east side of Detroit. Thousands of black residents were displaced into public housing projects, and soon, much of the accumulated black wealth from the Black Bottom neighborhood was lost. A generation of black youth began looking outside the city for opportunities.